Hostel One Prague i Prag, Tjeckien : Boka nu! A really nice hostel with a great location and a wonderful staff. Thanks to Hostel One for making our Prague experience really wonderful and easy. Riktigt socialt och trevligt ställe! Lätt att hitta andra att hänga med. På kvällen serveras gratis vegetarisk middag, och sedan organiserar hostelet någon typ av utgång. Vi hade jätteroligt på hostel one, och hade kul fest utan att bli väckta på natten. Vi saknade inget alls. Very nice atmosphere! There was always someone to talk to and the staff was very helpful. Free dinners is a nice thing but the food might not always be the most exciting, but hey its free food! Definitely worth a stay! A good place to stay if you’re going to prague to party! The staff are amazing! Awesome facilities with en suite bathroom. 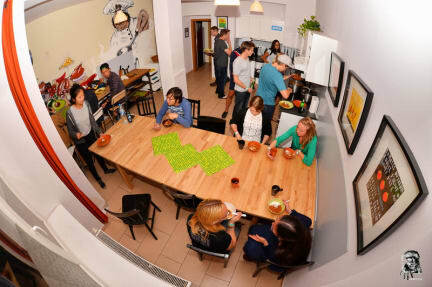 The hostel has a backyard and several common rooms including kitchen, TV room, chilling areas, etc. The free dinner is usually soup, so don't get too excited about it. The "Rave Cave" they have is little more than a basement with a bar but you're allowed to drink anywhere in the hostel, so no worries! Beer is super cheap. Possible to get laundry done. It's pretty central and it's easy enough to get around.